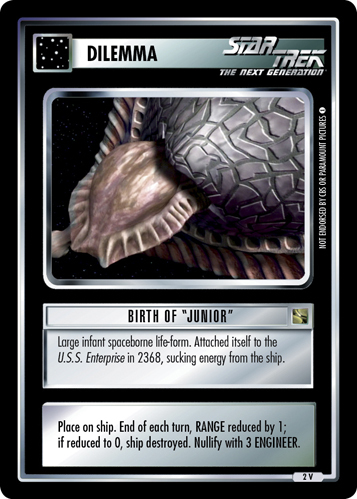 Large infant spaceborne life-form. Attached itself to the U.S.S. Enterprise in 2368, sucking energy from the ship. Place on ship. End of each turn, RANGE reduced by 1; if reduced to 0, ship destroyed. Nullify with 3 ENGINEER. Image Source: The Next Generation: "Galaxy's Child"